Batsman Joe Root says he will learn from the experiences of Yorkshire team-mate Jonny Bairstow after his call-up to the England squad. Bairstow struggled in his first appearances for the Test side against West Indies but starred in the third Test against South Africa. "Joe is solid, very grounded, works hard and thinks about his game. "This is a great opportunity he has now. I think it is a bit soon, it has probably come maybe six to 12 months too early. "But sometimes when you get thrown in, that can bring the best out of players. "He is the kind of kid that always need to be challenged and he needs to play against better players consistently. "In the long-term, I think he is going to be an exceptional player for England." 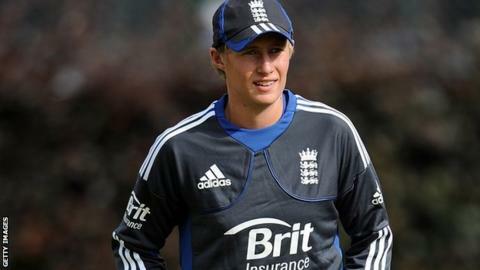 "I was gutted for him after what happened against the West Indies," Root told BBC Radio Leeds. "I'll definitely learn from what he went through." He added: "It was great to see him come back so strongly and become a better player. "To see someone so close and from your dressing room be so successful makes it seem almost within reach." Root, 21, enjoyed a fine season as Yorkshire gained promotion back to Division One of the County Championship at the first attempt and made the final of the FL t20. The Sheffield-born batsman was also named Young Cricketer of the Year by the Professional Cricketers' Association last Thursday. Yorkshire travel to South Africa for the Champions League T20 at the start of October and Root is hoping to use the time out there to prepare him for England's winter tour of India. "Everyone is really looking forward to it because it is something we haven't experienced before," Root continued. "I'll play some red-ball cricket while I'm out in South Africa to make sure I'm in just the right place coming into the tour." Despite the retirement of skipper Andrew Strauss and Kevin Pietersen being left out of the squad, Root is not taking his Test debut for granted. "I'm going to have to work hard because the selectors have got plenty of options," he concluded. "My main goal is to make the most of the experience out there, learn as much as I can and hopefully come back a better player."